As a general rule, it is necessary to ask the question why, for orbital tumours an orbital approach is more readily practised in the domain of neurosurgery than in the domain of ophthalmology or plastic surgery. There appear to be two circumstances that justify this decision: it is preferable to choose a neurosurgical approach in the case of lesions to the two posterior thirds of the orbit and/or in the event that it is necessary to check the excision of the tumour as well as that of reconstruction via an epidural or intra-dural approach. There are 3 surgical approaches that correspond to surgery of increasing difficulty which also suffers post-operative complications that become increasingly serious: the strictly intraorbital approach, the epidural approach and the intra-dural approach. In order to guarantee maximum safety during surgery, a difficult stage of the surgical approach should give the opportunity to check the approach to which it is contiguous: the intra-orbital approach should allow for epidural monitoring, and the epidural approach should allow for intra-dural monitoring. The intra-dural approach allows for monitoring all three but presents more deleterious side effects, and should therefore be reserved for accessing the anatomical structures such as the optic nerve, or for intra-dural tumourous extensions. The different approaches described here take place in microsur-gical conditions whenever the orbit or the interior of the dura are operated upon. Fig. 10. 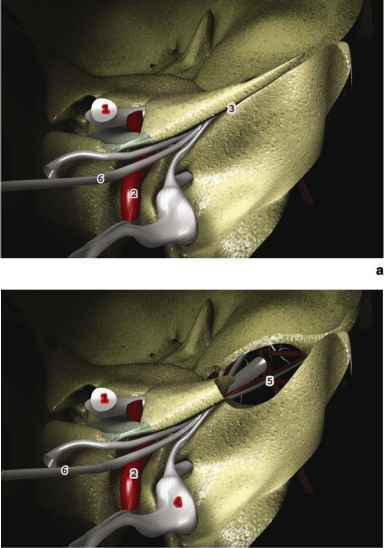 The lateral intra-orbital approach (dissection): (a) The "S" shaped incision; (b) the periorbit is unfastened from the lateral wall of the orbit; (c) osteotomy takes the form of a dovetail; (d) the bone excision can be performed as far as the superior orbital fissure, towards the rear mal provided the indication respects the anatomical limits that have been defined. From an aesthetic perspective, part of the incision is concealed in the eyelid (which must not be shaved); the posterior part of this latter bends towards the temple and can be usefully concealed in one of the wrinkles around the eyes. If the cutaneous closure is realised with care, it can become invisible within 3 to 6 months. The greatest obstacle is the frontal sinus. Before the age of ten years, it is little developed, if at all, and in adults can pneumatise the entire superior orbital margin as far as the external orbital process. Therefore, with this in mind, it is beneficial to use MR, and also CT, which provides more details of anatomical links with the frontal sinus. The frontal sinus may be opened accidentally or intentionally. If the opening is accidental, its size is generally small and the mucosa can be spared. There are more risks in ignoring the opening than there are difficulties in repairing it. In the case of accidental entry, the simplest method is to fill the opening with osseous powder and biological glue and close the gap from the exterior by applying a patch of temporal fascia stuck with acrylic-glue. When the frontal sinus has been opened intentionally it should be 'cranialised' by coagulating and resecting the mucosa of the sinus and filling the fronto-nasal canal with osseous powder and biological glue. The frontal sinus is the largest anatomical obstacle and brings many complications if these simple rules of exclusion are not respected. The patient is in the supine position with their head turned 30 to 45 degrees towards the opposite side, in a simple headrest (a three pins holder cannot be safely used in children). The incision begins at the middle of the eyelid (it can be extended towards the interior, and only towards the interior if the objective is to gain access to roof of the orbit) and bends, in an 'S' shape towards the temple when the external orbital process meets the malar bone. At this stage, it runs alongside the superior rim of the zygo-matic process (Fig. 10 a). The incision should go directly to the bone, and, if necessary the supra orbital nerve should be pushed aside from the supra orbital foramen. 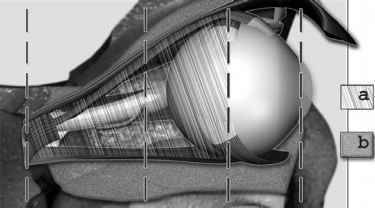 It is necessary to scrape the interior of the lateral orbital process and unfasten the periorbit from the lateral wall of the orbit (Fig. 10 b). The subcutaneous tissue is dissected from the fascia of the temporal muscle. Insertions of the temporal muscle are removed from the external temporal fossa and pulled towards the rear. This operation makes it possible to view the superior part of the external side of the great wing of the sphenoid. Osteotomy of the lateral orbital process may take the form of a step or, more simply, of a dovetail (Fig. 10c). 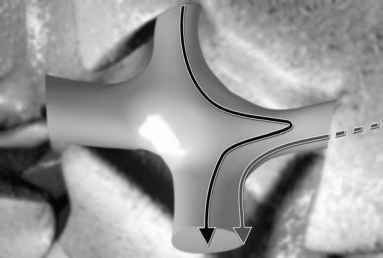 Once removed, the lateral wall of the orbit is gouged or drilled whilst keeping the periorbit at a distance. This bone excision can be performed as far as the superior orbital fissure, towards the rear (Fig. 10 d). Access to the intra-conical part of the orbit takes place between the superior and lateral rectus muscle. There is, therefore no interposition of important anatomical elements. By using this approach it is possible to check the dura and remove the lateral part of the orbital roof by drilling the bone immediately below the line of insertion of the muscle, as far as is necessary in order to reveal the dura. This hole should be situated underneath the ridge of insertion of the muscle in order to conceal it during closure. 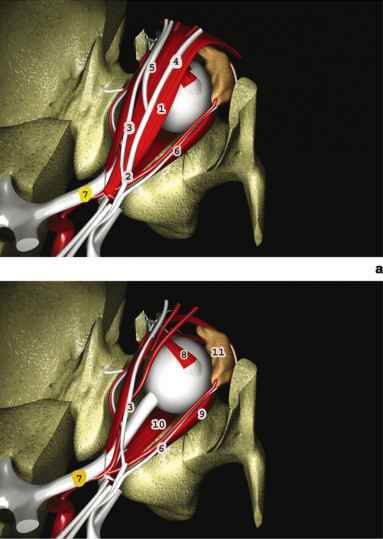 This approach, when compared with a trans browsal approach, has the advantage of being able to remain strictly epi-dural, to check the orbital roof using both the intra orbital and epidural approaches if necessary. Finally, it is always possible to carry out a supraorbital craniotomy by extending the cutaneous incision towards the interior of the eyebrow. However, this approach does not permit a satisfactory intra-dural opening or monitoring. The optic nerve approach is justified for two kinds of tumours: meningi-oma of the optic nerve sheath and optic nerve glioma. In the first case, approaching the optic canal is the key point of the operation, and in the case of optic nerve glioma it is not absolutely necessary to open the canal although the optic nerve should be checked during its intra-dural course. The patient is in the supine position with their head towards the zenith or at a slight hyperextension of 10 degrees to distance the frontal lobe from the orbit, by gravity. After coronal incision the temporal muscle is pulled forwards en bloc with the periosteum and the skin flap. The notch or the supra orbital foramen is exposed with the supra orbital nerve. 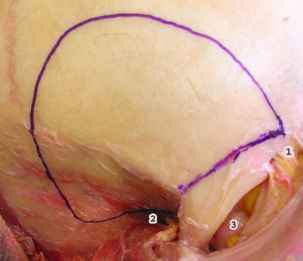 When it presents as a hole it should be open and the nerve individualized to be pulled forwards with the skin flap. A frontal craniotomy that is homolateral to the lesion is carried out. An accidental or intentional medial opening of the frontal sinus requires the same precautions to be taken as for a lateral approach of the orbit. In order to optimise the posterior field of vision and diminish cerebral retraction, it is possible to combine removal of the superior orbital margin after separating the supra orbital nerve from the orbital rim. It is possible, particularly with children, to carry out a combined approach in a single cranio-orbitotomy. The orbitotomy runs laterally as far as the lateral orbital process above the fronto-malar suture. It avoids opening the frontal sinus medially. The orbitotomy of the roof implies, in a first instance, perforating the roof with a one millimeter drill then detaching it like a postal stamp. The dura is separated from the orbital roof. This epidural separation does not, generally, allow the necessary space for exposing the whole of the orbital roof due to the impossibility of combining an epidural separation in the middle cerebral fossa. Under these conditions it is advisable to approach the orbit by an intra-dural approach. Careful retraction of the frontal lobe can be easily obtained after opening the optico-carotid cistern and the slow, progressive subtraction of the Cerebro Spinal Fluid (CSF). Exposure of the two posterior thirds of the orbit towards the rear of the eyeball and across the entire width is then complete. The axis of the optic canal permits easy identification of the internal part of the orbital apex. If necessary, the superior orbital fissure can be opened after drilling the anterior clinoid process. A wide dural flap, attached by a pedicle to the median line, is pushed back medially to expose the orbital roof. By opening the optic canal it is possible to determine the apical area, which would be exposed across its entire width, and complementing surgical exposure using either a drill or a thin bone rongeur. The frontal nerve appears beyond the transparent periorbit: it is an excellent landmark before opening the periorbit, a longitudinal incision is made at the base of the levator palpebrae superioris muscle and completed by two perpendicular contra-incisions, one of which is anterior at the level of the eyeball and the other posterior at the level of the orbital apex. 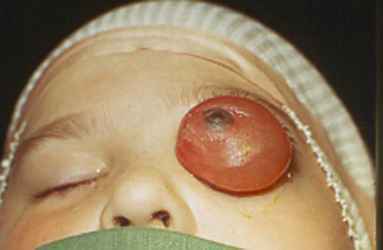 During this stage, any lesions to the trochlear nerve should be avoided as the nerve is situated medial to the frontal nerve, almost on the optic axis, in front of the roof of the optic canal. Orbital fat is usually considered as a dominating element of muscular function. However its coagulation and retraction appear indispensable in order to obtain a satisfactory view of the intra-conical anatomical elements. From the opened periorbit, there are 3 ways in which to penetrate the orbital cone. complex. The superior orbital fissure may be opened by making an incision to the annular tendon, backwards between the superior rectus muscle medially and the lateral rectus muscle laterally. 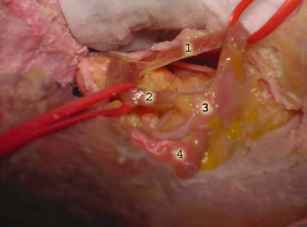 By pushing apart the two muscular bodies at the level of the tendinous incision, the superior branches of division of the oculomotor nerve, the nasociliary nerve and the abducens nerve can be seen [20, 63, 64]. Central Approach (Fig. 13). This approach is most often indicated for limited surgery such as biopsy. As the levator palpebrae superioris muscle horizontally overlaps the medial side of the superior rectus muscle, it is possible to push the levator palpebrae muscle away medially and the superior rectus muscle laterally. Each muscle is retracted by a surgical loop. The frontal nerve can be kept in position and pushed medially with the levator palpebrae, or dissected then pushed away laterally with the superior rectus muscle. This permits a better view of the optic nerve at the level of the annular tendon. The trochlear nerve, at this level, is in an extra-conical position, directly in front of the optic nerve sheath and medial to the frontal nerve. It merits particularly careful consideration. This approach permits access to the entire width of the middle intra-orbital third of the optic nerve. However, it can be deleterious for the branch of division of the oculomotor nerve that innervates the levator palpebrae superioris muscle and should, therefore be undertaken with extreme care. Underneath this branch of division that appears in the middle of the operating field of vision, the ophthalmic artery accompanied by the nasociliary nerve crosses the superior side of the optic nerve laterally to medially. Medial Approach. This approach runs medially between the oblique superior muscle and the levator palpebrae superioris muscle and the superior rectus muscle laterally. The optic nerve is thus exposed across its entire length. The ophthalmic artery appears at the medial side of the optic nerve after crossing it. An incision may be made to the annular tendon towards the rear, between the levator palpebrae superioris muscle and the superior rectus muscle in such a way as to expose the optic nerve, at the level of the apex. During this incision, care must be taken to protect the trochlear nerve because it is in an extra-conical position. sufficient for reconstituting an osseous interface between the orbit and the dura of the inferior side of the frontal lobe, and does not necessitate a bone graft. permit access to the pathological targets: the great wing of the sphenoid, the ridge of the lesser wing of the sphenoid, the superior orbital fissure ( Fig. 16 a), the anterior clinoid process, the optic canal, the dura of the fronto-pterional-temporal area which is involved in the case of orbito-sphenoidal meningioma, opening the frontal sinus should be avoided unless it is particularly pneumatised and partially covers the orbital roof. This is a rare occurrence and the craniotomy in the frontal area has to follow an angle of approximately thirty degrees from the horizontal plane. It is sufficient to expose the orbital roof without opening the frontal sinus. Multiplying the burr holes generally implies aesthetic sequelae. A single posterior burr hole in the hypothetic area the lateral fissure is often sufficient. This necessitates a slow and careful epidural unfastening which can be done with the Gigli's saw guide that permits an adapted length of interposition between the bone and the dura. Dural suspension should only be carried out at the end of the operation in order to avoid interfering with the epi-dural unfastening on the skull base. Removal of the superior orbital margin and of the zygomatic arch which is often advised  does not improve access to the posterior third of the orbit itself. This orbital-zygomatic removal can only be justified in the case of tumourous extensions towards the middle area of the temporal fossa, the petrous portion of the temporal bone and the pterygo-maxillar fossa. This technique does not strictly apply to the orbital approaches as we have defined them. The dura is opened then followed by the opening of the optico-chiasmatic and optico-carotid cisterns which allow gentle and progressive aspiration of the CSF thus reducing the brain volume in order to facilitate the epidural unfastening on the skull base. Often the dura is involved by the meningioma and we prefer to excise the pathologic area and repair it with an epicranial graft before drilling the skull base. The superior and lateral orbitotomy runs anteriorly to posteriorly from the pterion and the ridge of the lesser wing of the sphenoid (Fig. 16 b). It is necessary to begin drilling the superior and lateral wall of the posterior half of the orbit as the periorbit is more fragile at its anterior point. If the periorbit is torn, the gap will cause periorbital fat to escape, thus hindering the posterior field of vision for the surgeon. After having opened the superior orbital fissure (Fig. 16 c) and the optic canal (Fig. 16 d), the superior and lateral orbitotomy is completed forwards and terminates at the frontal and temporal bones. A large orbitotomy allows a partial reduction of the proptosis and the excision of the intra-orbital bud which spreads to the periorbit in an extra-conical position. The superior orbital fissure is opened after having drilled its roof; in other words, the ridge of the lesser wing of the sphenoid. This is the first orifice that is individualised. The anterior clinoid process lies posteriorly, the inferior and medial part of which is supported by the posterior root of the lesser wing of the sphenoid that corresponds to the lateral wall of the optic canal. Removing the clinoid process allows, on the one hand completion of excision when the pathological process concerns the anterior clinoid process and, on the other hand allows access to the optic canal via its external part . Opening the optic canal is recommended as visual acuity will be impaired. The drilling at this point must be carried out using drills of 1 or 2 millimetres. Monitoring the optic nerve is carried out after opening the sheath in the optic canal. Drilling the lateral part of the orbit terminates at the floor of the orbit, thus exposing the inferior optic fissure that links the inferior and lateral part of the orbit with the infra-temporal fossa on the one hand, and the pterygo-maxillary fossa on the other. Drilling of the temporal fossa is carried out downwards from the inferior orbital fissure and the foramen rotundum and oval posteriorly. It is important to avoid any contact with the periorbit as the orbit's fatty body will infringe onto the area of surgery, thus complicating the drilling operation considerably. If the periorbit is affected, it must be resected as much as possible. The periorbit is opened to the exterior of the frontal nerve that goes above and along the superior muscular complex. At the same level as the superior orbital fissure is the trochlea nerve which is situated medial to the frontal nerve, and is particularly vulnerable at this stage. The frontal nerve, which is a branch of the ophthalmic nerve, partially carries frontal palpebral sensitivity and is not a physiologically determining factor. The pathological process can spread backwards to the cavernous sinus. Its external wall can be peeled and coagulated without risk. A tumourous extension in the lateral wall of the cavernous sinus can be easily removed by excision, without risk. This is quite different to excision that is carried out in the cavernous sinus itself. Intra-cavernous surgery of meningeal residue is deleterious and this tumourous residue is easily accessible via radiosurgery or conformational radiotherapy. The periorbit is reconstructed using a fragment of pericranial graft sewn onto the periorbit which is considered to be safe. Bone reconstruction of the orbit is increasingly abandoned. As far as we are concerned, the only reconstructive surgery required concerns the defect of the frontotemporal bone defect (Fig. 1 c, d) which can be replaced by acrylic or a bone graft, thus compensating the atrophy of the temporal muscle and not allowing it to herniate through this bone defect which is often the cause of inaesthetic sequelae. The pathological limits are: periorbital, dural or osseous, whether radiological or macroscopic, and often very difficult to determine with precision; under such conditions the term of complete excision should be employed with great care. Intracranial neuronavigation offers a more precise schedule of excision when pre-surgical imaging and planning is carried out, but does not permit the application of a concept of excision that goes beyond extensions to these tumours, whose exact limits are not precise. However, only excision in safe osseous areas can minimise the possibilities of recurrences for the patient . Reconstruction of the orbit after a neurosurgical approach depends on the pathology concerned by the surgery, the extension of the osseous resections and on the nature of the bone which is sometimes affected by dysplasia. For aesthetic reasons it is always necessary to reconstruct of the orbital rim. Reconstructing the superior orbital and the lateral orbital rims is generally simple and necessitates either steel wire or screwed plates that may or may not be resorptive. This depends on each individual's preferences. In the case of bone defects concerning the orbital margin the same aesthetic reasons necessitate reconstruction. The most reliable method is an auto-logous graft. The most malleable substance and most suited to the constraints upon reformation of the orbital structure is the ribs, whether split or not. Harvesting is generally carried out before surgery. The number of sites of costal harvesting varies between 1 and 3. Small defects of the orbital roof do not require attention. However, large losses of substances necessitate reconstruction in order to maintain a solid interface between the dura of the frontal lobe and the periorbit. This reconstruction involves the split ribs when their removal has been made necessary in order to reconstruct the orbital structure or splitting the bone flap when removal of the ribs is not required. The bone graft is then simply inlaid or fixed from the superior orbital margin. It is not generally useful to reconstruct the lateral wall of the orbit. Even after complete resection of the tumour, the proptosis does not regress on occasions. This is why removing its external wall from the orbit plays such an important role in orbital decompression, as described in the guidelines for surgery for prop-tosis of Basedow's disease. In the case of an orbital location of Recklinghausen's disease, it manifests itself as a plexiform neuroma and radically alters the social life of affected patients due to its appearance and the functional difficulty that it entails. The objective of therapy is to re-establish the balance between orbital content and container, thus requiring simultaneous surgery to the osseous structures (for example, reducing the increased size of the orbital volume) and the soft tissues (resection of the tumour). It is imperative, in the case of facial symmetrisation, that the volume of the bony orbit is reduced. Excision or iterative resections of tumours that are carried out on the soft tissues appear to be factors of less importance in the short and long term results. On a frontal view, it is necessary to restore the inferior and superior orbital margins, which are thinner than usual and irregular, whereas on a sagittal view is necessary, on the one hand, to reduce the hernia of the fron tal or temporal lobe and, on the other hand to set it by reconstructing the dehiscent orbital roof. The orbital roof, which is thinner and perhaps even absent, must also be reconstructed . Indications for this depend on the size of the reduction in volume that is desired, and also on the preservation, or not, of visual function. Enucleation, despite allowing tri-dimensional control of the reconstruction operation, is always seen as a failure. Different approaches of reconstructive surgery have been suggested: the principle remains the same, which, in other words corresponds to a combination of separating the skull from the orbit, reducing the tumourous intra-orbital mass and remodelling the orbital skeleton. The osseous stage required for this operation associates to varying degrees, osteotomy and the on lay of organic material for grafts, or synthetic materials. Reconstruction of the orbit should begin with a transcranial approach , although the material to be used is still a subject of discussion . Jackson  proceeds with the reduction of the hernia and contention of the temporal lobe by reconstructing the great wing of the sphenoid with the aid of split rib graft. 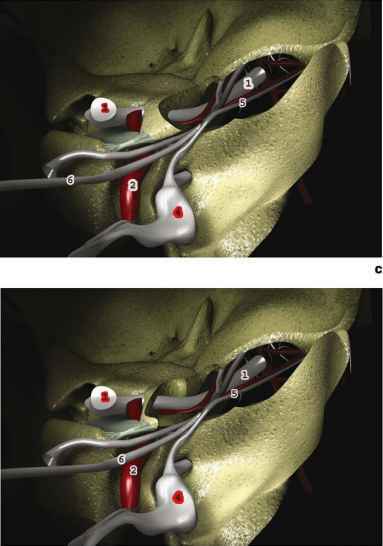 Marchac [45, 46] proposes splitting the frontal bone flap to compensate for the bone dehiscence. Ulterior resorption of osseous grafts amongst this pathological tissue has caused certain authors to prefer this method to using acrylic  or titanium . Reduction of the orbital content necessitates partial resection as total resection is rarely possible without inflicting serious functional impairment. Furthermore, in this instance the quality of resection depends entirely on the preservation of visual capacity. In many cases it is limited to tissular structures that are easily accessed by the superior defect. Remodelling the orbital skeleton aims to re-establish the balance between content and container by reducing the volume of the orbital whilst keeping the face symmetrical. This may necessitate osteotomy, but also appositional grafts or osseous substitutes. Associating osteotomy with autologous grafts would appear to yield better results in the long term. Jackson [34, 36] performs symmetrisation of the inferior orbital segment and the internal and lateral walls by means of osteotomy of the entire malar: this is possible by vertically cutting the internal wall of the orbit as far as the inferior orbital fissure. The zygomatic arch is sectioned and a horizontal maxillary osteotomy carried out below the infra-orbital nerve, in order complete the vertical osteotomy. Cutting the orbital floor facilitates the movement of the segment obtained in an upwards and medial direction. Any defect of maxillary bone can be compensated for with bone grafts, and the superior orbital margin benefits from split rib grafts. Munro  proposes inversed facial osteotomy in the event of maxillary asymmetry: this surgery combines a hemi-osteotomy of the type Lefort 1, and cranial-facial osteotomy of the type Lefort 3. The fragment that is obtained can be moved via posterior and superior rotation-translation. 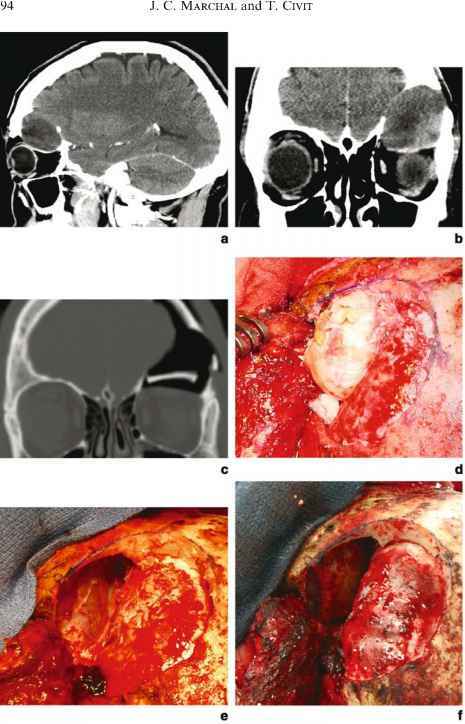 Facial symmetrisation is completed by bone grafts of iliac or costal origin Marchac [46, 47] completes an osteotomy of the external orbital margin and repositions the canthal ligaments. He combines this with the installation of osseous grafts to the orbital roof. Remodelling of the soft tissues follows osteotomy because, if the eyelid is affected this contributes to the imbalance between content and container. As far as possible, surgery at this stage should respect its function. This requires transfixing resection of the eyelid on horizontal and vertical planes, whilst taking care to maintain the functioning of the levator palpebrae superioris muscle. Marchac [45, 47] carries out resection of the cutaneous excedent, on the whole thickness by comparing the unaffected side. The levator palpebrae superioris muscle is re-inserted after reduction of its movement on the tarsus. An external canthopexy would conclude surgery. This pathology demands delicate surgery both to the osseous structures but also to the soft tissues. This is all the more true as surgery may still engender post-surgical complications . However, it does offer aesthetic and functional solutions that may be partial and imperfect, but are desired by patients. Modelling and conserving resection in fibrous dysplasia reduces the undesirable aesthetic element, but does not control the potential growth of the remaining process and the recurrence of deformation. Total or partial resection of the pathological tissue followed by reconstruction during the same operating stage would seem preferable [54, 17]. This method is based on ablation of the entire pathological process by an approach that may be intracranial when the FD is at the base of the skull, or facial when the FD has a lower extension. The surgical approach is endo cranial, facial or combined according to the size of the FD extension at the base of the skull. Reconstruction necessitates autologous bone grafts [17, 24, 35, 53, 54, 77] proposes reinstating the pathological tissue after remodelling. Decompression of the optic nerve in the optic canal follows the same principles as for the epidural approach of the optic canal in the case of orbito-sphenoidal meningioma. The indication of decompressing the optic canal is given when there is a reduction in visual acuity due to the optic canal being affected by the FD or when surgery is justified on the grounds of aesthetic consideration and there is a threat of compression of the optic nerve by its surrounding bone structures . The epidural and intra-orbital endo cranial approach yields the best results as it allows decompression of the whole course of the optic nerve. Moreover, accurate identification of the different anatomical elements makes this surgical approach safer and more secure . The main difficulty in this type of surgery is linked to the thickness of the dysplastic bone since the roof of the orbit can, on occasions reach a thickness of 1 cm.